The tiny tool has held up Roman togas and decorated punk rockers. Now, it’s a symbol of support. An Object Lesson. My mother, with her carefully trained eye, always knew when I had lost a button on my school uniform. She would rummage around her bag and produce a safety pin, fastening my blouse gently with it, taking extra care not to prick me. I always marveled at how elegantly she fastened the safety pin, with only the slightest trace showing on the buttonhole, the clasp neatly tucked underneath, invisible. As a tool, the safety pin’s design has remained largely unchanged for millennia. Its origins can be traced back to the fibula, an ornamental clasp used in Europe during the Early Bronze Age to hold clothing together. One of the fibula’s earliest designs deployed two separate pins: one with a hole on its left tip and another forming the bow or arc. The bow’s left tip fits neatly into the hole of the first pin, while its right tip forms a bent hook upon which the first pin’s tip rests. Another design, which resembles today’s safety pin, consists of one straight pin coiled in the middle to form a loop, with one end shaped into a bent hook where the other end rests. Fibulae were used by the Romans to hold their togas in place. The Etruscans used them to fasten dresses and cloaks. Since a fibula was visible to the public eye, it soon became more decorative than utilitarian. Made from expensive materials such as bronze, silver, and gold, the design of fibulae became more detailed and elaborate. As a result, they emphasized class differences, since only the wealthy could afford such costly ornaments. The fibula later evolved into the brooch, a decorative jewelry item used to fasten men’s cloaks and adorn women’s dress and hair. With its ornate, highly crafted designs, the brooch functioned almost exclusively as a status symbol for the wearer. Both the fibula and the brooch are historic examples of conspicuous consumption, a term coined by the economist and sociologist Thorstein Veblen in his 1899 book, The Theory of the Leisure Class, to describe the practice of displaying status and wealth by purchasing expensive, unnecessary items. In the 19th century, mechanization made safety pins easier to produce, eventually driving prices down. In time, pin money expanded its meaning, covering clothing and other personal expenses. The term is still used today to refer to money used for spending on inessentials. The safety pin’s life has been long but mostly modest; for more than a century, it quietly retained its original purpose, fastening pieces of fabric and items of clothing together. But that humility was broken when the safety pin made its way to popularity during the punk rock era of the 1970s. In her 2009 book, Punks: A Guide to an American Subculture, Sharon M. Hannon writes that New York style punk fashion consisted of “black straight-leg pants, black leather jackets, short spiky hair, and torn T-shirts held together with safety pins.” This get-up caught on with the punk rock crowd and safety pins became part of the punk culture, even making it into body piercings. Its punk-rock phase notwithstanding, the safety pin remains culturally traditional. In Ukraine, safety pins are attached to the inside of children’s clothes to ward off evil spirits. In Mexico, a safety pin placed as close as possible to a pregnant woman’s belly is thought to protect her unborn child from loss and diseases. In the Philippines, a safety pin is used to pin charms or amulets on a baby’s clothing to protect against bad fortune. Current uses highlight the “safety” in the safety pin. In India, safety pins are used by women to protect themselves against harassment in public spaces. A #safetypin Twitter campaign suggested wearing safety pins to show support for immigrants in the U.K. experiencing racist attacks after Britain’s vote to exit the European Union. Following in the U.K.’s footsteps, wearing safety pins in the U.S. has become an act of solidarity for those subjected to hate and vitriol in the aftermath of Donald Trump’s presidential win in the recent elections. As a tiny object of dissent, the safety pin has returned to its punk-rock roots as a symbol of opposition. 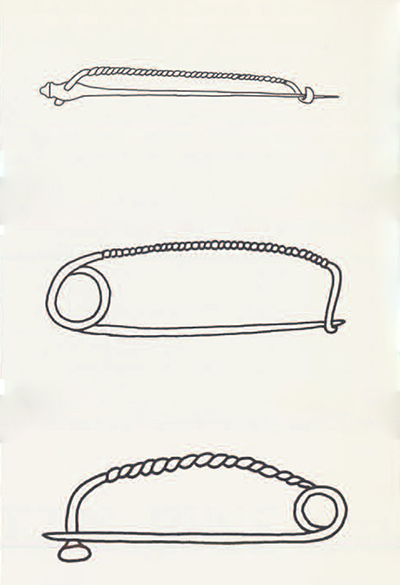 The safety pin’s origins as a fibula highlight class differences, but its current use to signify solidarity emphasizes support for marginalized communities. The safety pin has always offered a way to hold clothing together. Now it transcends that utility, promising to hold people together too. A memorable item of clothing from my childhood was a light blue chaleco, or vest, adorned with large safety pins. My mother bought me that chaleco, and it gave me the deconstructed look I thought was cool at that time. Even then, the safety pin had not changed. My vest was proof of its decorative use, channeling a previous punk rock phase. Like my mother, I now carry a safety pin in my bag. It comes in handy, especially when a button goes missing. There’s comfort in the safety pin’s sameness, knowing it will remain just as it is despite the passage of time. It’s that sameness that allowed me to learn the intricate art of fastening a safety pin from my mother, and that will allow me to pass on the use of this tool to my daughter. How many objects have remained the same since antiquity? Every safety pin holds something together. In addition, it also holds on to time itself. Rina Caballar is a writer based in Manila, Philippines.